note: All $ amounts in this article are Canadian dollars. This is a company that was suggested to me by a reader of the blog as a cheap company that's in the process of turning around. I've kept the company on my radar and finally decided to write them up. Sangoma is a technology company that develops and sells hardware and software solutions for the telephony market. I'm actually somewhat familiar with this technology because I worked in a building where the landlord was obsessed with Asterisk (a Sangoma product) an Open Source PBX software product and he'd routinely come upstairs and tell anyone who was listening (or not) all about what he was playing around with. Sangoma is fascinating because they are a company that was founded on an Open Source platform and successfully sell Open Source software and hardware solutions. For any non-gearheads out there Open Source is software where the creator gives away the computer code used to generate the program for free and allows users to modify the code. Other examples of Open Source programs are the operating system Linux, OpenOffice, Sun Solaris, amongst millions of other programs. Many advocates of Open Source treat it as a bit of a religious campaign, but it's really just a way of licensing software in a way that enables work to be shared with a community. The best analogy I could think of is that Open Source software is like if an automaker gave away all of the specs to build the car to anyone who asks for them. While Open Source has a reputation for free software Sangoma has taken that platform and build customer hardware devices and customized software and turned a nice profit with it. Sangoma states that they are the biggest distributor of Asterisk outside of the company which holds the copyright to it. The best way to think about Sangoma's product suite is to think of your office phone system. Sangoma builds all of the hardware to handle voicemail systems, routing calls to different offices, transitioning between digital and analog among other things. The software to manage the entire system is custom built on the Open Source platform. A customer might buy a Sangoma telephone card for a standard PC and then install the Asterisk software on the PC turning a cheap PC into an office PBX solution. -The company is very asset rich, with $7.6m net cash/share against a market cap of $15m. -The company is profitable and cash flow positive. -Free cash flow has gone into buying back shares, the company has authorized a 5% reduction in shares. -EV/EBIT of 6 for the 9 months of the 2010-2011 fiscal year. -Margins: 72% gross, 13.5% operating, 11% net. -A new CEO was appointed in September 2010 which could be a catalyst for improved growth. The company experienced a very disappointing Q1 2011 (July - Sept) with a 20% drop in sales and a 90% drop in net income. The company attributed the drop to a lack of new products in addition to softness in the North American market. At the same time they brought in a new CEO who has been successful at past companies. In addition to the drop in sales and net the company also experienced a contraction in margins. While gross margin has remained somewhat steady the net margin has gone from the low 20% to 11% an almost 50% drop. While Sangoma appears to be cheap on some basic metrics they also look like they have the perfect conditions in place for a decent turnaround. If the CEO is able to jump start product development (which is happening in the most recent quarter an increase in R&D was recorded), and raise the net margin back to the historical norm the company should treat shareholders well. Due to the volatile nature of the business and the company being in the midst of a turnaround I decided to work out a few different valuation scenarios. 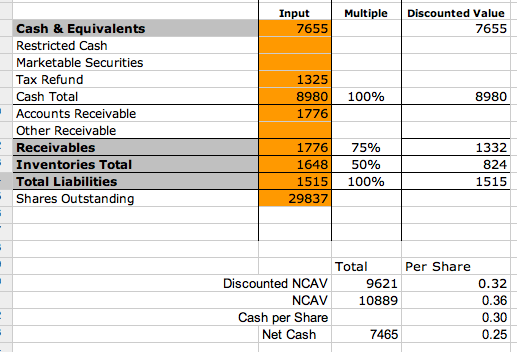 The raw NCAV is $.36, with cash per share of $.30 and net cash per share of $.25. I should also point out the income tax item which I added to this spreadsheet. You might be wondering why they are getting a tax refund if the company's profitable, I asked the same question as well. Sangoma is the recipient of some tax credits, and development incentives from the Canadian government regardless of profitability. The base case assumes that Sangoma will be liquidated or is only worth its asset value, for a company with consistent profitability and free cash flow I don't think that's accurate, so let's take a look at two other models. $.40 + $.25 = $.65/share or 25% above the current price. I think the medium case value is an accurate fair value for Sangoma if profits stay steady at the current level. As mentioned above I think the medium case is probably a bit on the low side as well assuming performance will stay depressed, so onto the best case scenario. I did the best case in two parts, the first is zero revenue growth with a return to the previous net margins, and the second is 5% revenue growth with the same 20% net margins. It's pretty clear the value proposition with the shares is that management will be able to reverse the margin contraction and restore net margins to the historical 20%. If they're able to do that Sangoma is the proverbial $1 for $.50. Are you still following STC? I have their valuation as more attractive now than before. What would hold you back from buying a business trading for less that its NCAV, slightly more than its liquid assets, and FCF positive business? Thanks for the comment, I hadn't looked at them in a while. I agree with you on the FCF but I'm not seeing the change in NCAV, it actually looks like it dropped a bit, there are 3m more options outstanding than in July. I went back and reworked my net-net worksheet, I got .27 as the discounted NCAV, .31 as NCAV and .19 in net cash. I'd be interested to see your calculations, sheet me an email at oddballstocks at gmail dot com. Wondering if you're still following Sangoma and a quick update on your thoughts!